In honor of Veterans Day, ABC News recalls these touching military stories. In honor of Veterans Day, ABC News is recalling some of the most heartwarming military stories we’ve covered in 2017. 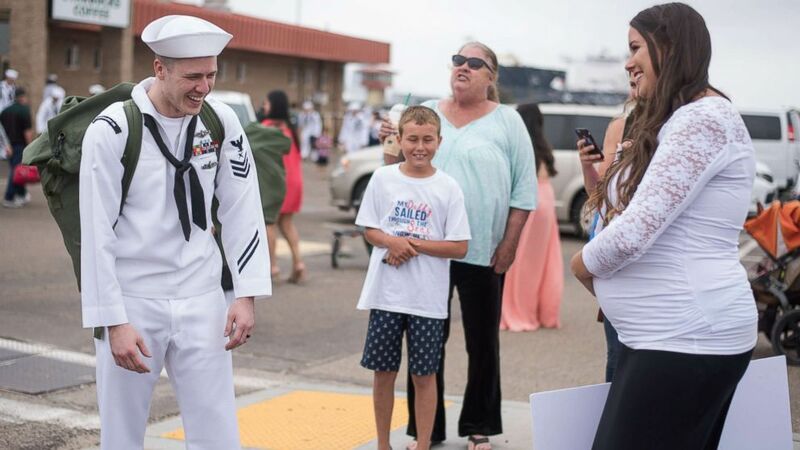 Both active-duty service members and veterans made headlines for touching homecomings, surprise marriage proposals or other emotional and uplifting moments. Here are some of those stories as the U.S. marks its 98th Veterans Day. (Claire Bira/Imageclairity.com) Alison Ferrell's 92-year-old uncle, Bill Lee Eblen, served as her "something blue" in his Marine dress blues at her May 13 wedding. 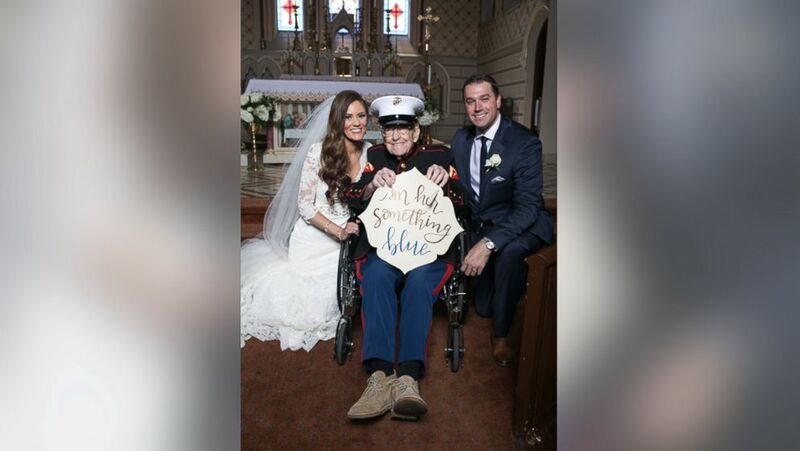 Alison Ferrell’s “something blue” at her May 13 wedding in Cape Girardeau, Missouri, was her 92-year-old uncle, Bill Lee Eblen, who wore his Marine dress blues. 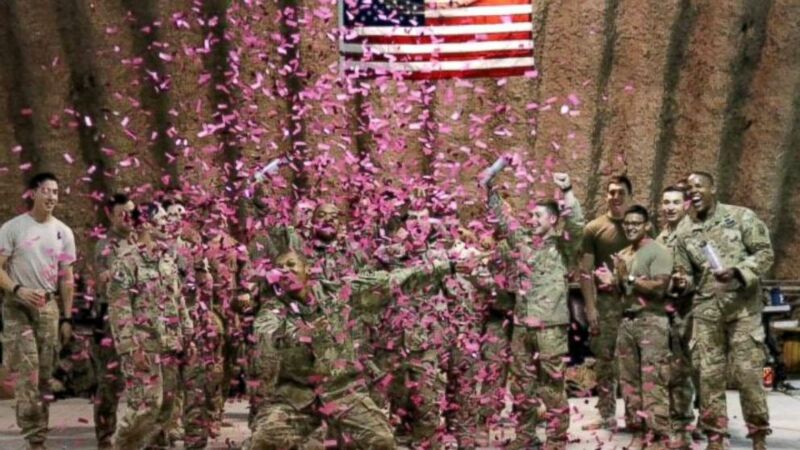 (Britt Harris) U.S. Army soldiers deployed in Afghanistan used pink confetti to reveal the gender of Brit and Chris Harris's baby. Britt Harris’ husband, Chris Harris, died while deployed with the U.S. Army in Afghanistan just one week after his wife told him she was expecting their first child. In order to keep Chris Harris’s fellow soldiers close to their child, she decided to let them be the first to reveal the gender. The soldiers filmed themselves opening the poppers in Afghanistan in front of an American flag. 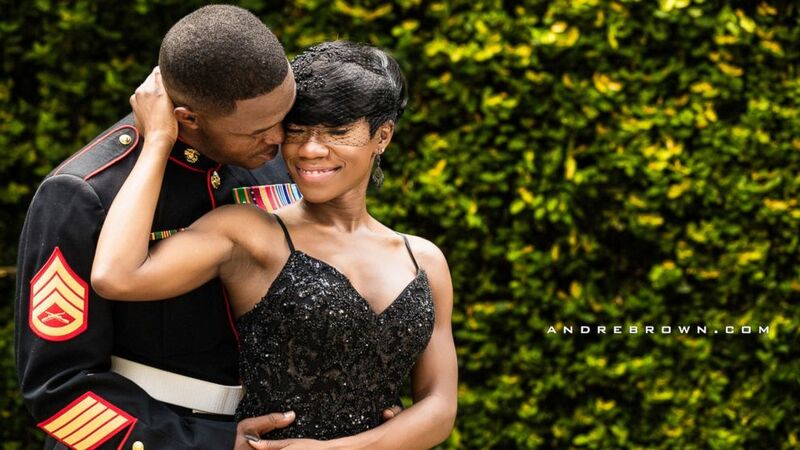 Nakita Brown and Rymario Armstrong, a Marine veteran, had been engaged for three years before they finally tied the knot in a beautiful wedding ceremony in Beaufort, South Carolina, on July 4. The catch? The entire thing was a complete surprise for her groom. (Chicago Zoological Society) Capt. 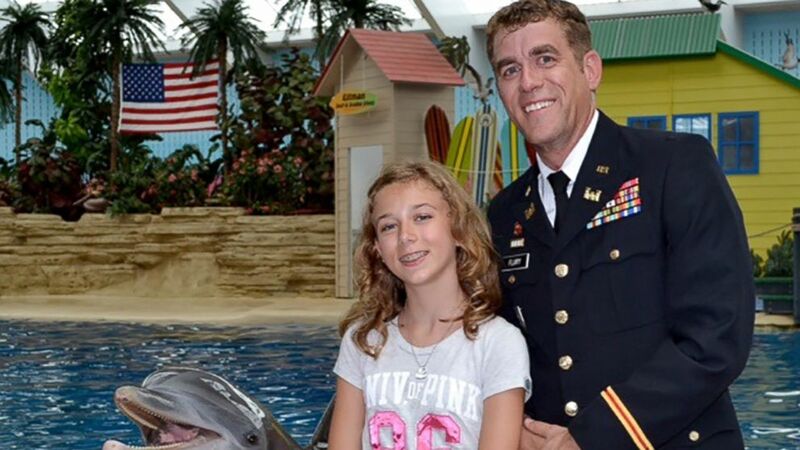 Josh Flury returned home from a 9-month deployment and surprised his 12-year-old daughter, Kristi, at Chicago's Brookfield Zoo. Kristi Flury, 12, thought she was on a mom-daughter date at Chicago’s Brookfield Zoo when she and her mom sat down to watch the zoo’s dolphin show. When Kristi, of Sycamore, Illinois, was chosen to participate in the show, it became a dream fulfilled. Kristi’s dad, Josh Flury, a captain in the U.S. Army Reserves, surprised her after a nine-month deployment to Kuwait. (kyndalrosephoto/Facebook) Kevin Porter, a U.S. Marine Corps drill instructor, had a tea part with his 4-year-old daughter, Ashley, in honor of April being the Month of the Military Child. 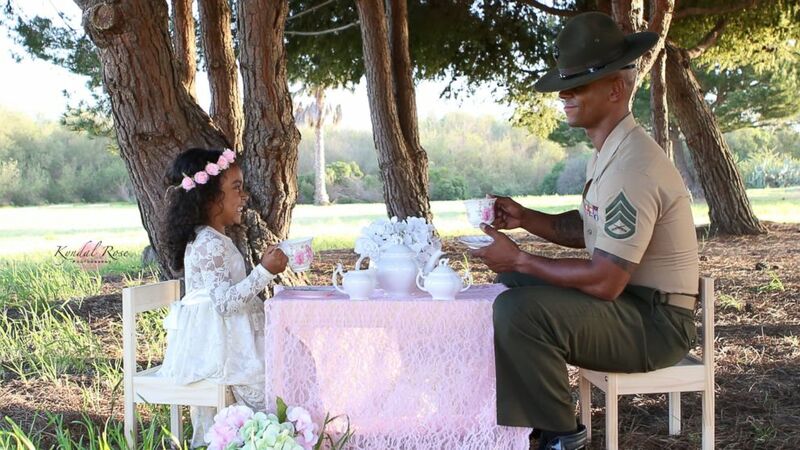 This military father had a very magical tea party with his 4-year-old daughter, Ashley, and the special moment was captured on camera. “I found out about a week after he left. I didn’t believe it,” Natasha, 28 told ABC News. (Katherine Anne Photography) Jon Trommer, a Marine, surprised his girlfriend by popping the question on her snowy doorstep. 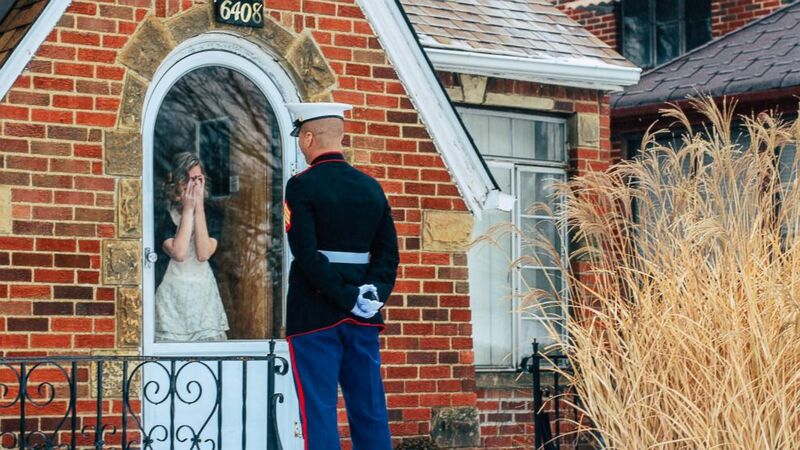 Marine Jon Trommer, adorned in his dress blues, surprised his girlfriend, Mandy Wehe, on the snow-covered doorstep of her parents’ home in Parma, Ohio, to pop the question. She had no idea he was home from being stationed at Marine Corps Air Station Miramar in California, let alone with a diamond ring.